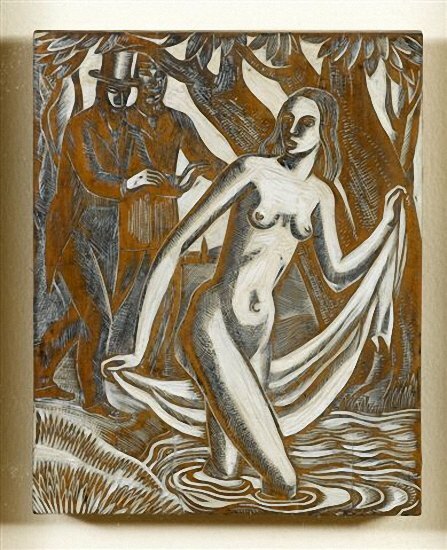 John Archibald Austen [commonly known as John Austen] was born in Buckland, Kent, England, on 5 January 1886 and trained as a carpenter before moving to London in 1906 where he embarked on a career as an artist. His early work was influenced by the Aubrey Beardsley school of illustrators. In 1925 John Austen exhibited at St. George’s Gallery in London along with Harry Clarke and Alan Odle. In the late 1920s Austen returned to Kent and took a teaching post at Thanet School of Art in Margate, Kent. John Austen was a prolific illustrator over a period of twenty-five years (from 1921-46). He also worked as a commercial artist and drew press advertisement for Buoyant easy chairs and settees and Sunbeam Cars. He was the author of a book on the technique of illustration - ‘The ABC of Pen and Ink Rendering’ (London: Pitman, 1937). Examples of John Austen's work are included in the permanent collections of the Ashmolean Museum in Oxford, and the British Museum in London.